Small Business Tip Featured Archives - … catching light in motion! Tag Archives for " Small Business Tip Featured "
I’ve been looking at local search for a while now, being listed in Google places has helped my business tremendously by being ranked well in a Google organic search results, so much so that my business is a favorite place on Google. (I got the fancy QR code sticker and everything.) In the last few months I have been studying other local search such as foursquare and yelp. I have been asking experts in the photography field about how local search affects photographers online and had an interview with Rosh Sillars, co-author of “The Linked Photographer’s guide” on his podcast the new media photographer. Yesterday I got a call from a very kind and knowledgeable sales rep from Yelp and I had a long phone call with him this morning. I learned a lot about Yelp and thought I’d share it here. 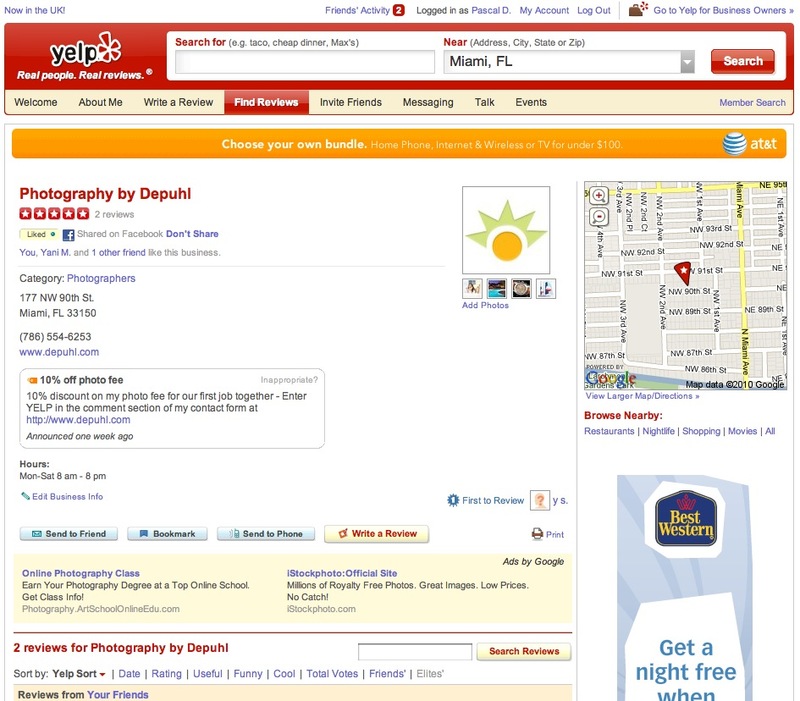 Yelp’s business listings let your customers write reviews about your business and also give you a chance to add some basic information about your business, similar to a profile on Google local. It includes your address, contact info, link to your website, map of the business location, room for a special offer, your opening hours, some options for sharing this listing and writing a review and a space for an add of your competitor (more on that later).